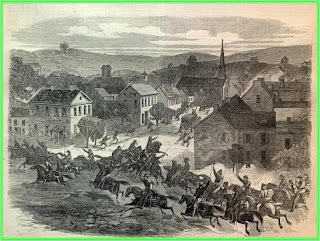 Nearly all the major battles of the Civil War were confined to the South or the border states, the one major exception being the Battle of Gettysburg in Pennsylvania. But just a little more than two weeks later, on July 19, 1863, there was also an important battle fought in and along the Ohio River at a place called Buffington Island, adjacent to Meigs County 20 miles southeast of Pomeroy, Ohio. In the big scheme of things, the Battle of Buffington Island, involving 13-15,000 men, was fairly minor. However, it was the only significant engagement fought in Ohio and is noteworthy as well for the fact that three future presidents of the United States -- James Garfield, Rutherford B. Hayes, and William McKinley -- were involved. How many other Civil War battlefields can make such a claim? 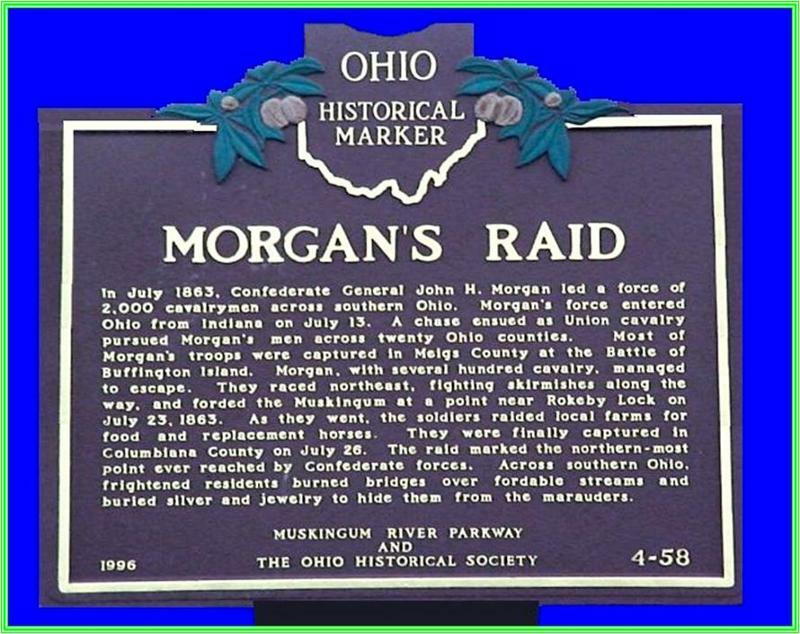 Morgan's Raiders were essentially a guerrilla band of cavalry who terrorized southern Ohio for two weeks under the dashing leadership of General John Hunt Morgan. Born in Huntsville, Alabama, on June 1, 1825, Morgan first enlisted in the U.S. Army for the Mexican War, in which he served as a lieutenant of cavalry. In September, 1861, he joined the Confederate Army as a scout but soon became captain of a squadron. Morgan began a short but colorful career at the head of his eponymous Raiders in Tennessee in May, 1862, striking behind thinly stretched Union lines with some 900 men. He cut railroad tracks, disrupted communications, attacked detachments of Union troops, and destroyed military equipment. He repeated these tactics in August near Nashville, where he had captured more than 1,700 prisoners by December. By the end of the year his force had grown to a division, with two brigades and 4,000 men, and Morgan had risen to the rank of brigadier general. In May, 1863, the Confederate Congress formally commended him and his men. In June, 1863, General Braxton Bragg authorized Morgan to undertake another raid in Kentucky. Morgan began operations on July 2 with 2,400 hand-picked men. Within a week he exceeded his instructions, crossing the Ohio River into Indiana where he surprised a Union detachment of home guards. He then moved east through southern Indiana and swept through the suburbs of Cincinnati, Ohio. Riding 21 hours a day, Morgan's men and horses were exhausted to the extreme when they reached Buffington Island, where Morgan had hoped to cross the Ohio River. Major General Ambrose E. Burnside, commanding the Union Army's Department of Ohio, had sent a 14,000-man force of Federal cavalry and infantry after Morgan's much smaller band of riders. Following a series of running skirmishes across southern Ohio, Union forces finally caught up to Morgan at the town of Portland in Meigs County, not far from the Ohio River port of Pomeroy. Having chosen that spot to take advantage of a ford across the river, Morgan was met by Union forces which included three Federal gunboats. In a day-long, running fight, 10-12,000 Federal infantry and cavalry engaged Morgan's unit in the fight known today as the Battle of Buffington Island. Union forces commanded by Brigadier Generals Henry Judah, James Shackelford and Edward Hobson met Morgan's Raiders in the narrow flood plain on the Ohio side of the river, with the safety of Virginia enticingly beckoning the Southern cavalier. When the Yankee forces finally caught up to Morgan's column around three in the afternoon, Morgan requested an hour to decide whether to surrender. Shackelford granted the truce, which Morgan used to prepare a defense. Judah's force pinned down the Confederates, while Hobson's 4,000 troopers first flanked, then charged into Morgan's column. Maj. Daniel McCook, 65, and the father of the famous Fighting McCook brothers, was mortally wounded in the opening volleys of the fight. Morgan's men were driven back across the flat, wide-open flood plain, their line of escape across the river cut off by the Federal gunboats. The Confederate troops had to fight their way out, finally running a gauntlet of Federal forces. Morgan's brother-in-law and chief lieutenant, Col. Basil W. Duke, was captured as were nearly 1,200 of Morgan's "terrible men," including the commanding general's younger brother. Most of those captured were imprisoned in the Ohio Penitentiary in Columbus. Fifty-two of Morgan's men lay dead on the field. 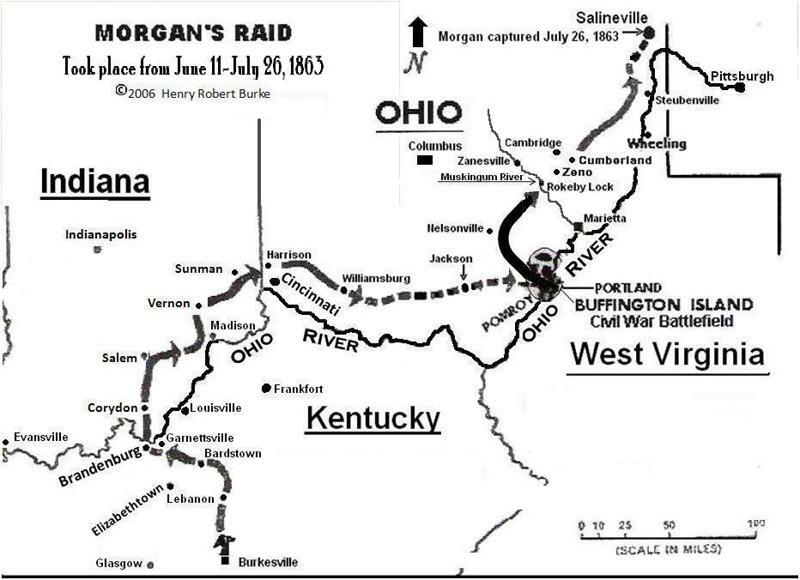 Morgan himself escaped to the northeast, again being driven from another fording of the Ohio by the Federal gunboats. 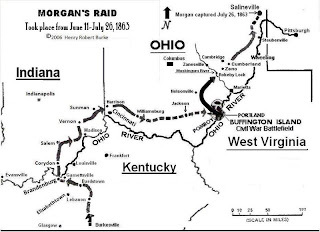 As the gunboats approached, Morgan himself was halfway across the river, with a large portion of his command still on the Ohio side. Unwilling to abandon these men, he turned back and his force sought an escape route on Ohio soil. 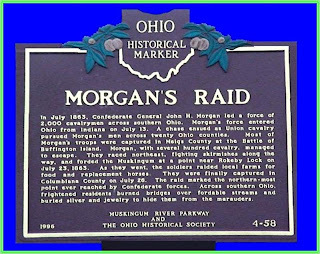 Several days later, Morgan and some 300 survivors were surrounded and defeated near New Lisbon, in Columbiana County, Ohio, on July 26, to join Duke in the Ohio Penitentiary. Morgan escaped, however, and in April, 1864, became a commander of a Virginia unit. He was killed in Tennessee by Union forces on Sept. 4, 1864. His guerrilla campaign, still remembered in Southern Ohio, had helped draw off Union forces from Tennessee.